Last night in Los Angeles, an all-star group of musicians came together to pay tribute to Soundgarden singer Chris Cornell. Musicians who appeared during The I Am The Highway: A Tribute To Chris Cornell at the LA Forum included the remaining members of Soundgarden plus Metallica, Melvins and Foo Fighters. Other stars to perform included Ryan Adams, Jimmy Kimmel, Josh Homme, Fiona Apple, Brandi Carlile, Miley Cyrus, Adam Levine, Ziggy Marley, Chris Stapleton and more. The evening opened with Melvins playing a five-song set that started with their own Kicking Machine and climaxed with a cover of Soundgarden's Spoonman. 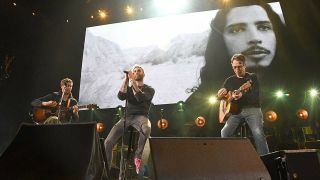 Foo Fighters' four-song contribution kicked off with Soundgarden's No Attention and closed with an acoustic version of Everlong, while Metallica's set included both Master Of Puppets and For Whom The Bell Tolls. The evening climaxed with sets from Temple Of The Dog (including appearances from Stone Gossard, Brendan O'Brien, William DuVall, Jerry Cantrell, Josh Freese, Fiona Apple, Matt Cameron, Miley Cyrus, Brandi Carlile and more) before Soundgarden were joined onstage by Taylor Momsen, Buzz Osbourne, Tom Morello, Taylor Hawkins, Wayne Kramer, Peter Frampton and more. The final song of the evening was Black Hole Sun, with Brandi Carlile on vocals. Full list of songs and musicians below.